Lord Rama is one of the most commonly adored gods of Hindus and is held as an ideal man and is the hero of the epic Ramayana. Lord Rama is the seventh incarnation of Lord Vishnu. 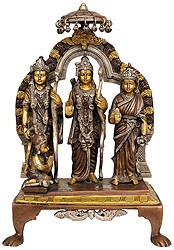 Lord Rama is a very popular form of God in India as shown by the many temples to him. Sri Lakshmana exemplifies sacrifice. Leaving his wife behind in the palace, he accompanies his brother (Rama) in exile. Sri Hanuman is monkey formed god. He is a noble hero and great devotee of Lord Rama of the Ramayana. He is also called Mahaveera (the great hero) or Pavan-suta (son of air). He is revered for his selfless courage, devotion and strength. He is represented holding a mace. He was the wisest of the wise, strongest of the strong and bravest of the brave. He was the Sakti of Rudra. Those who meditate on him and repeat his name may attain power, strength, glory, prosperity and success in life. He is worshipped in all parts of India, particularly in Maharashtra. 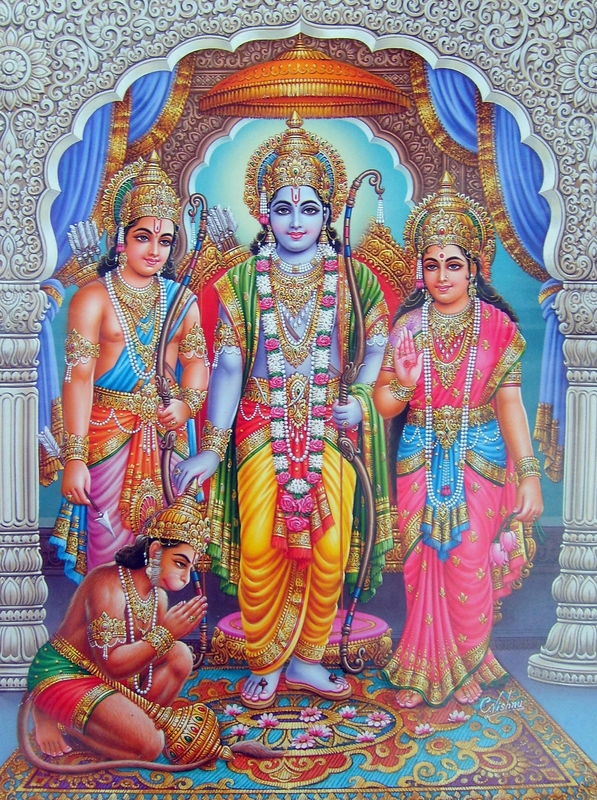 He was the chosen messenger, warrior and servant of Sri Rama. He lived to serve Rama. He made untiring search to find Sita. At the time of danger he exhibited marvellous courage and presence of mind. Hanuman, as the faithful devotee with great physical and magical powers, is one of the most beloved images in the Hindu pantheon with temples of his own throughout India. Aside from his superhuman strength and magical powers Hanuman was well versed in the Scriptures. His crossing the sea of thirty miles in one leap, lifting the crest of a mountain in the palm of the hand, and his carrying of the brothers on his shoulders from the nether world to Lanka are some of the feats of Hanuman recorded in the Ramayana. This is the story; of Lord Rama’s exile from his kingdom, and his exploits in southern India with his wife Sita, his younger brother Lakshman, and his faithful friend/devotee Hanuman. The demon king Ravana abducts Sita and takes her to his fortress on the island of Lanka (Sri Lanka). A war starts, as Ram and his animal allies attacks the demons, destroys them, and return to North India to take back his lawful throne. The festival of Dussehra commemorates Lord Rama’s adventures and includes the public burning of huge effigies of Ravana.